Won 4 races at 3 & 4 years (6f) and was placed once. Won Stewards Cup, Goodwood beating Borderlescott (Gr 1). Half brother to Mutakayyef, winner of the Gp 2 Summer Mile Stakes, Ascot (2016) and the Listed Ganton Stakes York (2016). Also placed 2nd in Gr 3 Strensall Stakes, York and Gr 3 Darley Stakes, Newmarket; and, 3rd in Gr 1 Juddmonte International Stakes, York. Half brother to Intimation,winner of the Clodovil EBF Garnet Stakes, Listed at Naas, 2016. His dam Infallible won Nell Gwyn Stakes Newmarket Gr 3. 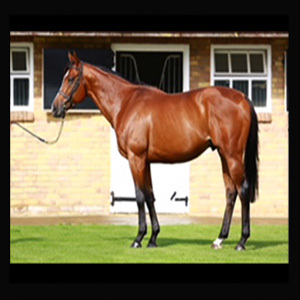 He comes from the immediate family of Garswood top rated older sprinter in France in 2014. By Oasis Dream Champion 2 year old in Europe in 2002. Sire of leading stallions Showcasing, Power, Aqlaam, Captain Gerrard and young stallions Muharram, Frozen Power, Gale Force Ten, etc.